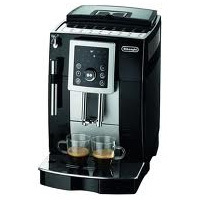 A small footprint super automatic espresso maker, this DeLonghi model isn’t much larger than a regular coffee maker and has a sleek, attractive design. The intuitive controls are straightforward and make programming various drinks fairly simple. We were happy with how easy it was to maintain the machine following the prompts on the screen; the hopper and drip tray come off without a fuss and are easy to clean. Best of all, its $999 price is quite reasonable given the coffee quality and special features it offers.